This is a fun game which most of the people have played in their childhood but is text based. In this game, players fix a number of points and the first player texts an array of underscores each denoting a letter of the subject word. The other player assumes a letter that they feel to be the part of the chosen word. If the assumed letter is correct, the first player puts the letter in one of the underscores that fills the slot. In case the assumption is incorrect, the player loses a point. Whosoever wins will choose a different word. The game induces all players to think harder. This game is great for enhancing the vocabulary skills of the people. It reduces both the boredom as well as stress. It is a simple game wherein players choose a random word that needs to be separated and its letters are rearranged to form maximum combination of words possible. Players may choose a time frame mutually agreed upon that varies from five minutes or longer. Whoever makes a greater number of words is declared the winner. This game is usually played face to face but can also be done over text also. This game reveals the nature of your friend. It is played with a question that starts with “would you rather” and followed by presumptive circumstances. They can be interconnected or aloof. However, both the options carry the same importance. The question should be creative yet the best questions are those which represent awkward but fantastic options. This is a good game to get to know oneself but funny and absurd at the same time. Example for the question may be “would you rather live rich or become a saint with no money for the entire life”. It is a quite old game and is a classic game based on logical reasoning that became a big hit off late. The game is played between two people. The methodology of the game is that one player has to choose an object, an animal or a person and the other player has to guess the answer with in twenty questions. Once the subject is chosen by the player, the opponent has to put a series of questions through texts in order to close down to the answer. The answers are to be in form of a “yes” or “no”. Normally the game is played with multiple players but can also be played between two players. It is getting to know you game and reveals the natures of your friend. The players will make statements about what they have never done before taking their turns. Every time a statement is made in contrast to his experience, the opponent loses a point. The questions and answers will make some of the dark secrets of the players involved. This game is most enjoyed by the people who has a love music. It is a texting game and fills the people with lots of fun by removing all the boredom. The mode of playing the game is that one player texts quoting a few lines from the song to the opponent. Else one player also can text some dialogues from a movie. The opponent has to guess the song or movie from which the lines/dialogues have been taken. Failing to guess the right answer will warrant the opponent to sing the song/complete dialogues. This is a great game for writers and can be played between two or more players. As we say joint thinking is far better than the thoughts of a single person, the game uses the same principle. One player texts the beginning words, sentence and the other player reciprocates with another word, sentence. Another player will text another word, sentence and the game progresses there on. All the words put together will form a story that may be an epic or a nightmare. This game also can be played facing each other. The players can text their pictures to each other while choosing a dare. Such pictures may be deleted later. It is normally played in social gatherings but can also be enjoyable playing over texts without losing the fun quotient in it. If the player chooses truth, he has to answer the question truthfully. In case dare is chosen, the camera of the player should focus on the evidence of the dare. The beauty of the game is that all the truth will be exposed. However, the questions should not be offensive so as to hurt the feelings of others. This is fantastic, fun game to play over the phone where you select a topic of conversion and you need to talk about it for a minute. It looks very simple, but you are not allowed to deviate from the topic at any time and should not repeat any word more than once. This game enhances the oratory skills of a person as well as the knowledge of words. This is a game which can be a little bit of flirting with texting your boyfriend or girlfriend if you are comfortable with. It can be fun in case you have not met your friend for some time. One player starts with a sentence about himself/herself but leaves a word blank for his/her partner to fill it up. The good element in this game is you leave your partner thinking about you that amounts to a little bit of flirting but fun. However, nobody should spoil the tempo of the game by texting absurd statements. 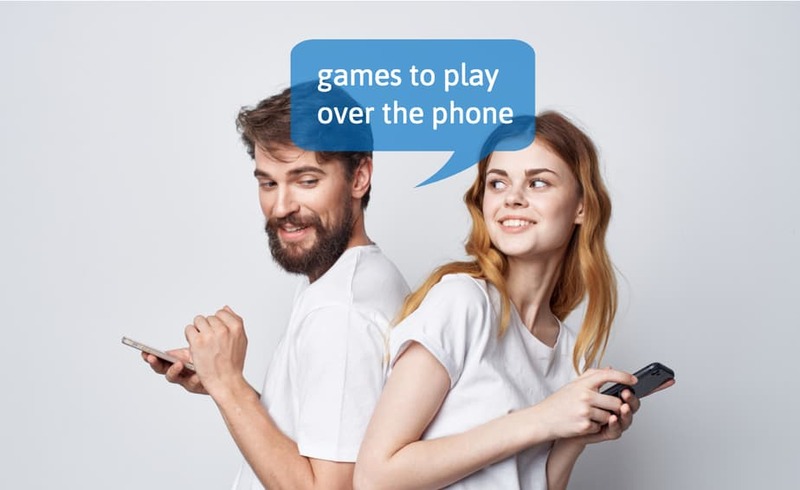 Please let us know if you have more such games to play over the phone in mind.